Preheat oven to 400. For crust thaw hash brown patties and break apart, add egg and salt & pepper. Mix together then spread on a greased pizza stone. Pat down with the back of a spoon. Bake 20 minutes, remove from oven. For topping, whisk eggs, milk, and salt & pepper in a glass dish. Microwave on high for 3 minutes; stir. Microwave and additional 3 minutes. 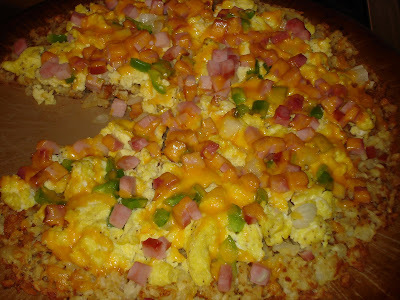 Spread cooked egg mixture evenly over crust; top with ham, onion, bell pepper and cheese. Return to oven and bake for 10 minutes. This is another one of those "weekend" recipes. It's really easy to make and so yummy. You can add any toppings that you like, (tomatoes, olives, mushrooms).